bDepartment of Neurosurgery (S.H.C. ), Ulsan University College of Medicine, Asan Hospital, Gang-reung, Republic of Korea. BACKGROUND AND PURPOSE: Spinal epidural arteriovenous fistulas are rare vascular malformations. We present 13 patients with spinal epidural arteriovenous fistulas, noting the various presenting symptom patterns, imaging findings related to bone involvement, and outcomes. MATERIALS AND METHODS: Among 111 patients with spinal vascular malformations in the institutional data base from 1993 to 2017, thirteen patients (11.7%) had spinal epidural arteriovenous fistulas. We evaluated presenting symptoms and imaging findings, including bone involvement and mode of treatment. To assess the treatment outcome, we compared initial and follow-up clinical status using the modified Aminoff and Logue Scale of Disability and the modified Rankin Scale. RESULTS: The presenting symptoms were lower back pain (n = 2), radiculopathy (n = 5), and myelopathy (n = 7). There is overlap of symptoms in 1 patient (No. 11). Distribution of spinal epidural arteriovenous fistulas was cervical (n = 3), thoracic (n = 2), lumbar (n = 6), and sacral (n = 2). Intradural venous reflux was identified in 7 patients with congestive venous myelopathy. The fistulas were successfully treated in all patients who underwent treatment (endovascular embolization, n = 10; operation, n = 1) except 2 patients who refused treatment due to tolerable symptoms. Transarterial glue (n = 7) was used in nonosseous types; and transvenous coils (n = 3), in osseous type. After 19 months of median follow-up, the patients showed symptom improvement after treatment. CONCLUSIONS: Although presenting symptoms were diverse, myelopathy caused by intradural venous reflux was the main target of treatment. Endovascular treatment was considered via an arterial approach in nonosseous types and via a venous approach in osseous types. Endovascular embolization, an operation, and combined therapy have been the main treatment methods for SEDAVFs. Although various endovascular treatment options in terms of approach routes and embolic materials have been reported,2 the best treatment method has not been determined because of the complex anatomy of the target lesion. An understanding of the manifestations and anatomy of the lesion is the key to accurate diagnosis and proper management.13 We present 13 cases of SEDAVF from Asan Medical Center, studying their various clinical manifestations, radiologic features, and outcomes after endovascular treatment. We retrospectively reviewed a data base of our institution, a tertiary hospital, that was maintained prospectively since 1993 to identify all spinal vascular malformations (ie, spinal arteriovenous malformation, spinal dural/epidural arteriovenous fistula, and vertebrovertebral fistula). Among 111 spinal vascular malformations diagnosed at our neurointervention suite from January 1993 to April 2017, we included 13 patients with SEDAVFs. The diagnosis was confirmed by high-resolution selective spinal angiography. Patient information regarding the clinical history, neurologic symptoms and signs, and follow-up results was obtained from the data base connected to the electronic medical record. Patients' symptoms were classified as myelopathy and radiculopathy according to the initial neurologic symptoms and signs. “Myelopathy” was defined as spinal cord symptoms with gait disturbance, motor/sensory deficits, or urinary/bowel sphincter dysfunction; “radiculopathy” was defined as a series of symptoms along the specific dermatomal distribution. We evaluated the presence of functional disability using the modified Aminoff and Logue Scale of Disability (ALS)14 and the modified Rankin Scale.15 The scores were based on the records of the patients' symptoms and neurologic examinations, which were described by neurologists not directly involved in treatment. The venous drainage pattern of the SEDAVFs was analyzed on the basis of the 2D angiographic findings to determine whether there was retrograde intradural reflux through the radicular vein. MR imaging, CT, or dual 3D rotational angiography or a combination of these was used to demonstrate bone involvement of the SEDAVFs.13 The “osseous type” was defined as an SEDAVF with bone involvement, such as bone erosion, osteolytic destruction, or compression fracture (Fig 1). Schematic diagram of a spinal epidural arteriovenous fistula. An osseous SEDAVF shows bone involvement and compression of the nerve root or the spinal cord by bulging with cortical erosion (A). A nonosseous SEDAVF shows engorgement (fistulous sac or pouch) of the epidural vein (B) within the spinal canal compressing the spinal cord (C). Spinal MR imaging was performed for initial assessment of the disease. Axial and sagittal images of T1- and T2-weighted sequences with or without contrast enhancement were obtained with 1.5T or 3T systems. The presence and extent of spinal cord edema, perimedullary flow voids, and any epidural lesion that compressed the nerve root or thecal sac were assessed on imaging. Patients who needed imaging evaluation clinically after treatment underwent follow-up MR imaging. Spinal digital subtraction angiography (Artis zee; Siemens, Erlangen, Germany) was used for localization and characterization of the SEDAVFs. All possible feeders—including vertebral arteries, thyrocervical and costocervical trunks in the cervical lesions, and lateral and medial sacral arteries from internal iliac arteries in the lumbosacral lesions—and all segmental arteries were scrutinized. 3D rotational angiography further clarified the location of and relationship among the arterial feeders, fistulous sac (pouch), arterialized veins, and the point where intradural reflux occurred. Endovascular embolization was considered primarily when the vascular approach to the fistula appeared angiographically possible. There were 2 modes of treatment in which transarterial embolization (TAE) was used for nonosseous SEDAVFs; and transvenous embolization (TVE), for osseous SEDAVFs. The treatment strategy of nonosseous SEDAVFs was basically similar to that for SDAVFs: to occlude the shunt and the proximal drainage vein. The range of the embolization target was the point at which intradural reflux occurred, to obliterate retrograde venous drainage into the radicular vein leading to congestive venous myelopathy. The glue, a mixture of N-butyl-2-cyanoacrylate (Histoacryl®; B. Braun, Melsungen, Germany) and iodized oil (Lipiodol®; Guerbet, Roissy, France), was used at the wedged position via a transarterial approach.16 The TVE was used when multiple arterial feeders converged on the fistulous sac in the osseous defect of the vertebral column and the fistulous sac could be approached via a transvenous route through the epidural vein. Various types of detachable and pushable coils were used for TVE. “Complete occlusion” was defined as disappearance of the fistula or shunted vein and an obliteration of the intradural venous drainage by disconnecting the fistulous sac with retrograde radicular venous drainage in the SEDAVF with congestive venous myelopathy (Fig 2). “Partial occlusion” was defined as having residual retrograde flow into the retrograde intradural vein, especially in SEDAVFs with congestive venous myelopathy or delayed opacification of the fistula or shunted veins on the venous phase with prominent contrast stasis in SEDAVFs with radiculopathy without retrograde intradural venous drainage. Spinal epidural arteriovenous fistula (perimedullary venous drainage) in a 63-year-old woman (case 4). A, Sagittal T2-weighted MR imaging reveals diffuse spinal cord edema up to the T5 level and multiple signal voids in the posterior aspect of the cord. B, Right lumbar arteriogram shows an arteriovenous fistula at the L2 level with multiple fine feeding arteries and early venous drainage to the epidural and paravertebral venous plexuses and to intradural veins (arrows). A small venous sac is visible around the fistula (arrowhead). C, 3D rotational angiogram shows the anatomy in detail where the intradural reflux originated (arrow). Note the focal narrowing of the vein where it penetrates the dura (arrowhead). D, Volume-rendering image demonstrates the epidural location of the fistula and the venous pouch (arrowhead). An intradural course of the radicular vein is also visible (arrow). E, Postembolization 3D angiogram confirms the presence of radiopaque glue in the fistula and along the intradural vein (white areas). F, Follow-up MR imaging 2 months later shows that the diffuse cord edema and the perimedullary vessels have disappeared. The patients' neurologic symptoms and functional abilities were recorded with the use of the ALS and mRS scores on every follow-up. We evaluated the outcomes by comparing the scores at initial status with those at the most recent follow-up. We used STATA, Version 13.0 (StataCorp, College Station, Texas) to perform statistical analysis. All data were organized as the mean and range of continuous variables and as the number and percentage of categoric variables. Statistical significance (P < .05) among the scores was determined with a Student t test or the Wilcoxon rank sum test (if the assumption of normality was violated on the Shapiro-Wilk normality test). A general overview of the patients' information is presented in the On-line Table. Of the 13 patients, 10 were male and 3 were female; the mean age was 49.6 years (range, 16–67 years). The mean duration from symptom onset to diagnosis was 3.6 months (range, 1 week to 24 months). Bilateral lower extremity weakness and sphincter dysfunction were typical manifestations of congestive myelopathy, which was noted in 7 patients with intradural venous drainage. Of the 6 patients without intradural reflux, 4 patients had radiculopathy or compressive myelopathy, which manifested mostly with pain, weakness, and paresthesia along the particular dermatome. The other 2 patients had only pain without neurologic symptoms. Three patients had a history of trauma (ie, case 1: T12 compression fracture due to a fall 3 years before; case 7: L1 compression fracture due to fall 3 years before; case 13: a fall 2.5 years before without vertebral fracture). Initial MR imaging, which was performed in all 13 patients, showed abnormal findings. Both spinal cord edema and perimedullary flow voids were noted in 7 patients with congestive myelopathy. Of the 6 patients without intradural reflux, 1 patient demonstrated focal signal change in the spinal cord, caused by the mass effect of the epidural vascular lesion. The other 5 patients demonstrated only epidural vascular lesions without spinal cord involvement. Among 5 patients who had an osseous type of SEDAVF, 4 patients underwent CT, which showed bone involvement at the fistula level. 2D and/or 3D spinal DSA confirmed the presence of epidural arteriovenous fistulas in all 13 patients. The lesions were categorized into 2 groups according to the existence of intradural reflux. 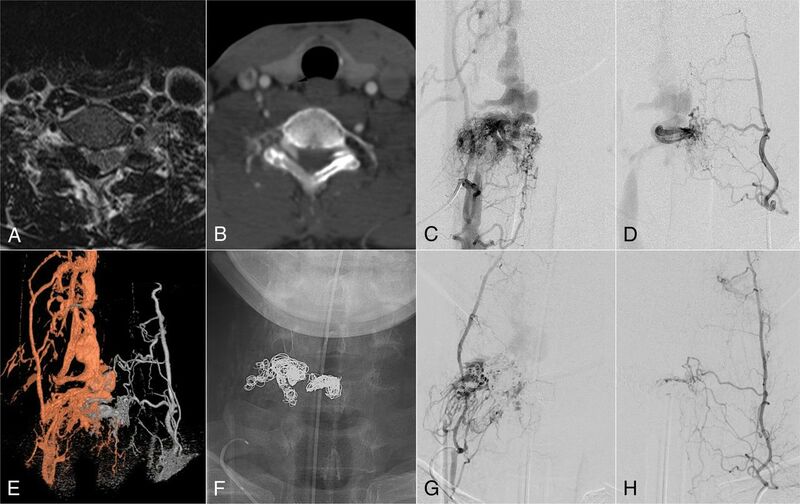 Seven patients showed intradural drainage through the radiculomedullary and perimedullary veins. Of those 7, only 3 patients had solely intradural drainage without any extradural component. 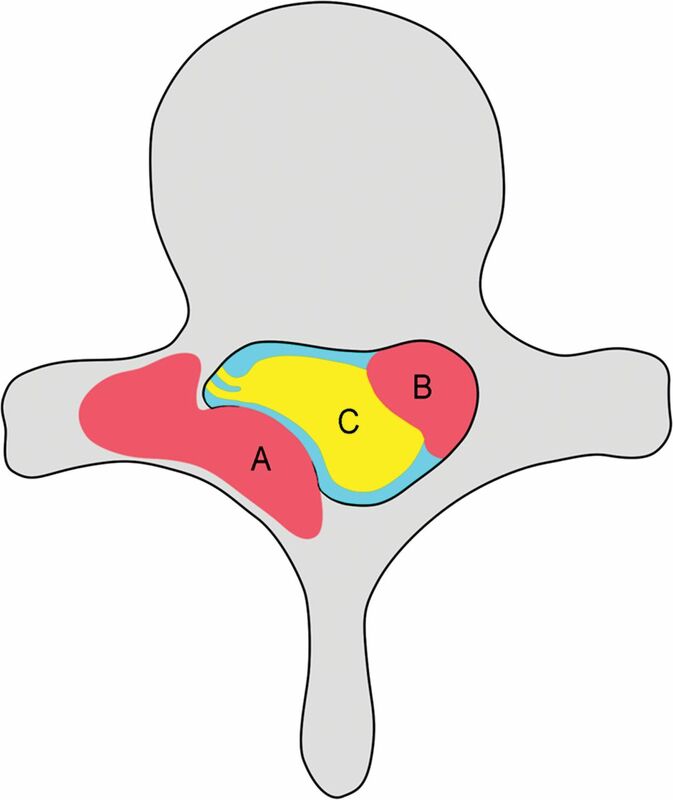 The distribution of the fistulas in the intradural reflux group were thoracic (n = 2), lumbar (n = 3), and sacral (n = 2), while that of the pure extradural group was cervical (n = 3) and lumbar (n = 3). Adjacent bone involvement of the SEDAVF was demonstrated in 5 patients on 3D angiography. Among the 13 patients with SEDAVFs, 10 patients received endovascular embolization, 1 patient underwent an operation after the endovascular treatment was aborted, and 2 patients refused treatment due to tolerable symptoms (On-line Table). Endovascular embolization comprised TAE in 7 patients (Fig 3) and TVE in 3 patients (Fig 4). TAE was selected in all patients with nonosseous SEDAVFs. The embolic material used in TAE was glue in all patients and additional coils in 1 patient. Transvenous coil embolization was performed in 3 patients with osseous SEDAVFs. Complete obliteration of the fistula or intradural drainage vein was achieved in all 6 patients with congestive myelopathy. Among the patients without intradural venous reflux, complete occlusion was possible in 1 patient, and partial occlusion, in 3 patients because complete obliteration was not usually required. 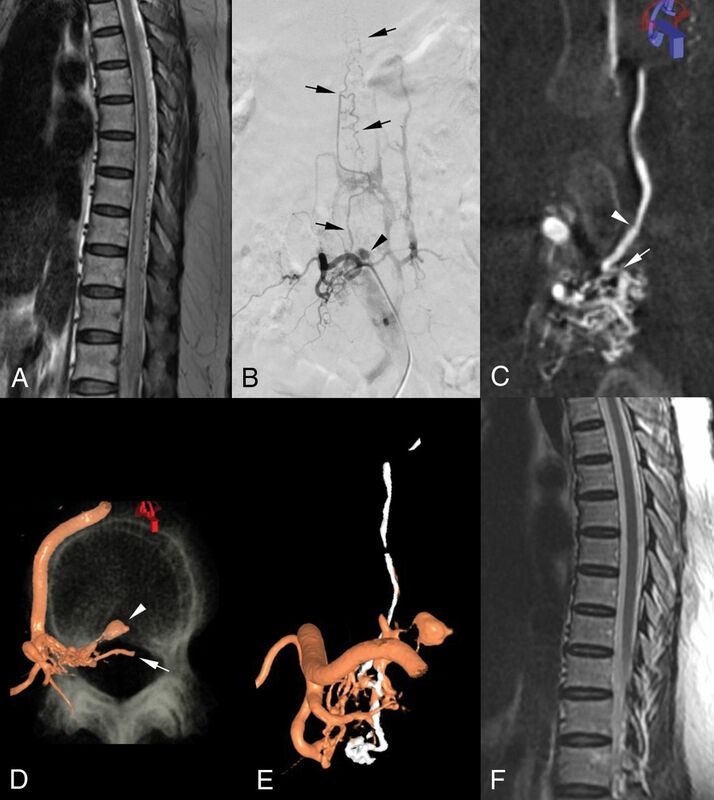 Surgical disconnection of the intradural drainage vein was successfully performed in the patient in whom the endovascular approach failed due to complex vascular anatomy. There was no periprocedural complication in all treated cases. Osseous spinal epidural arteriovenous fistula in a 57-year-old man (case 9). A, T2-weighted axial MR image reveals a well-defined lesion with dark signal intensity in the right epidural space at the C6 level. B, CT scan at the corresponding level shows adjacent bone destruction of the right lamina and spinous process of the C6 vertebra that resulted from the well-enhanced epidural lesion. C (right) and D (left), Deep cervical arteriograms. A large arteriovenous fistula with multiple arterial feeders is visible at the C6 level. E, 3D fusion image demonstrates that the feeders from both sides converge on a focal region—the epidural venous plexus and internal jugular veins—from which venous flow drains exclusively via extradural veins. F, After 2 sessions of transvenous coil embolization, the fistula flow has almost completely disappeared (G and H). Outcomes in patients according to each scoring system and the presence of intradural reflux. The mean scores of the initial and follow-up evaluations are shown. Asterisks indicate statistically significant improvement at follow-up. Among 11 patients who underwent either endovascular treatment (n = 10) or an operation (n = 1), the mean duration of follow-up after treatment was 23 months (range, 1–63 months; median, 19 months). The other 2 patients without treatment were lost to follow-up. The mean ALS and mRS scores were significantly decreased at follow-up in the intradural reflux group (8.0 versus 4.7, P = .01; 3.4 versus 2.5, P = .016, respectively) (Fig 4). On the other hand, the group without intradural reflux showed a tendency toward decreasing scores without significance. The overall scores were higher in the patients with intradural reflux in all the grading systems. The scores of ALS were zero in the patients without intradural reflux at both initial assessment and follow-up. Symptoms and functional status improved, or at least did not change, after treatment in all except 1 patient (case 5). In this patient, mild lower back pain developed 4 months after treatment despite improvement in other symptoms. Endovascular treatment is currently the favored method of SEDAVF treatment; the use of endovascular treatment has been reported in approximately two-thirds of pertinent studies and case reports.2 The rates of complete or near-complete occlusion of the SEDAVF with endovascular treatment ranged from 73.3% to 94.4%, and the rates of symptom improvement ranged from 62.5% to 91%.1⇓–3 Our study also demonstrated an excellent occlusion rate (100%) and good treatment outcomes (91%). Intradural venous drainage, noted in 53.8%7 of the 13 patients in this study, was seen with variable frequency in previous studies (27.0%2 to 74.5%4). 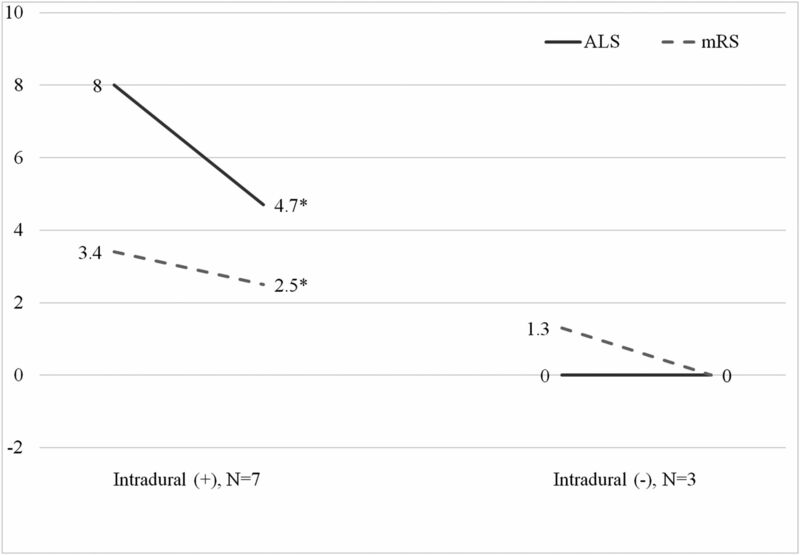 In this study, ALS scores were zero in all patients without intradural venous drainage except for 1 patient who had mild leg weakness caused by compressive myelopathy. This study included 5 cases (38.4%) of osseous SEDAVFs, even though only a few cases of SEDAVFs with bone involvement have been reported previously.18⇓–20 The mechanisms of formation of the bone lesion and its clinical significance are uncertain. When planning a treatment option, identification of the osseous type can be important. Because Osseous SEDAVFs tend to be a high-flow shunt with large epidural venous spaces, a transvenous approach may be possible.8 In our cases, 3 underwent TVE, 1 underwent an operation, and the other one was under observation because the symptoms were tolerable. Although trauma was suggested as a cause of SEDAVFs, especially in the osseous type,19,20 only 1 patient in our study (case 1) was confirmed to have a history of trauma in which a T12 compression fracture was caused by a fall 3 years before the initial presentation. Because the patient's symptoms developed after the trauma and the fistula occurred at the same level, we assumed that the SEDAVF could have been the result of the trauma, despite the long interval. A history of previous trauma was also noted in 2 other patients (cases 7 and 13) with the nonosseous type of SEDAVFs in our study. A limitation of this study could be that the number of patients was very small because of the rarity of SEDAVFs. Diagnosing the patients only through imaging findings without pathologic confirmation could be another limitation. Follow-up spinal MR imaging or DSA was not performed in all patients because we did not do routine imaging studies as long as symptoms improved. Long-term follow-up will be required because not all patients were followed up for a sufficient time. SEDAVFs were found in 13 (11.7%) patients of the all spinal vascular malformations in our center. The presenting patterns were diverse, from tolerable symptoms (n = 2) and radiculopathy (n = 5) to congestive venous myelopathy (n = 7). There is overlap of symptoms in 1 patient (No. 11). The intradural venous reflux was identified in all 7 patients with congestive venous myelopathy. Osseous SEDAVFs were observed in 5 patients in whom the fistulas were successfully controlled by TVE (n = 3) except 2 patients who underwent an operation (n = 1) and only clinical observation (n = 1). Nonosseous SEDAVFs were observed in 8 patients (intradural reflux in 5) in whom obliteration of the fistula including intradural venous drainage was achieved by TAE, except 1 patient who refused treatment due to tolerable symptoms and wanted clinical observation. The SEDAVFs were successfully treated in 11 patients by endovascular embolization (n = 10) and an operation (n = 1). After 19 months of median follow-up, most patients showed symptom improvement after treatment. This work was supported by the National Research Foundation of Korea grant funded by the Korean government (No. 2018R1A2B6003143). Accepted after revision October 12, 2018.